The name Yuroz has been synonymous with love, romance and the celebration of the human spirit for over three decades. The artist’s work is coveted by many collectors. His compositions are always balanced with elements of contrast. He leaves hints in his representations, starting with his symbolism with varied subtle mood changes by varying his compositions, deploying his lines, shades, and using colors differently, moving the focal point, and attenuating the emotional connection ever so slightly. 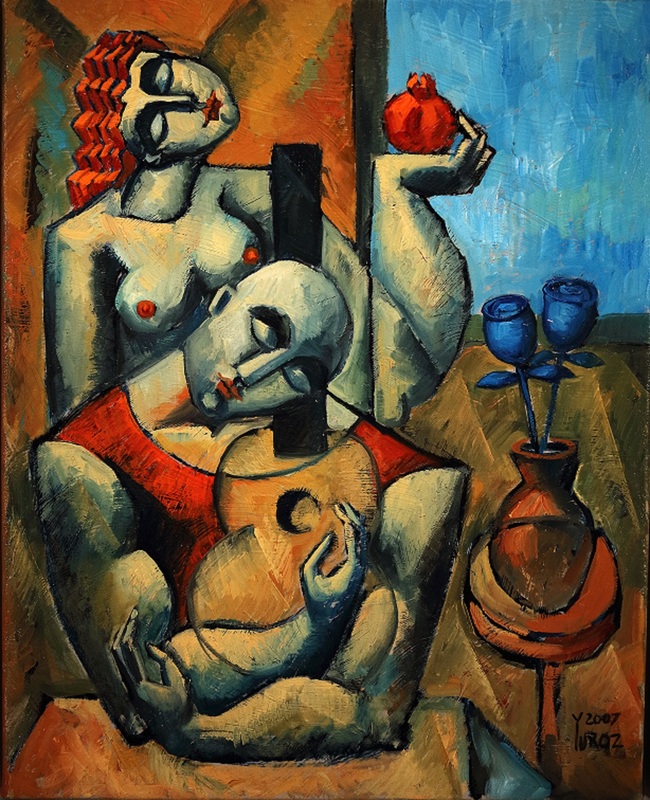 If you ask a collector why he or she brought one of Yuroz’s paintings home, while the answers vary, the one common thread is the emotional connection the collector made with his work. About a month ago, a client on a road trip from Canada came to visit our studios in downtown Los Angeles. She browsed through many pieces of original art hoping to bring home a unique find. After much consideration, she picked “Inspired by Different Things”, a 9″ x 12″ acrylic/mixed medium on paper. After receiving her home safe message and the photo showing off the temporary home for her new Yuroz find (see image above), I found myself staring at the painting and comparing that with the visual images in my head of a couple other compositions based on the same capsule of time the artist captured, done in a span of six years. I realized that the evolution of these compositions demonstrates Yuroz’s expression of one single moment that has obviously been etched in his mind all those years. Each time he relived that moment, each time he was moved to highlight different elements in the “Different Things” from that inspiration, as he gave more weight to something different that reminds him. 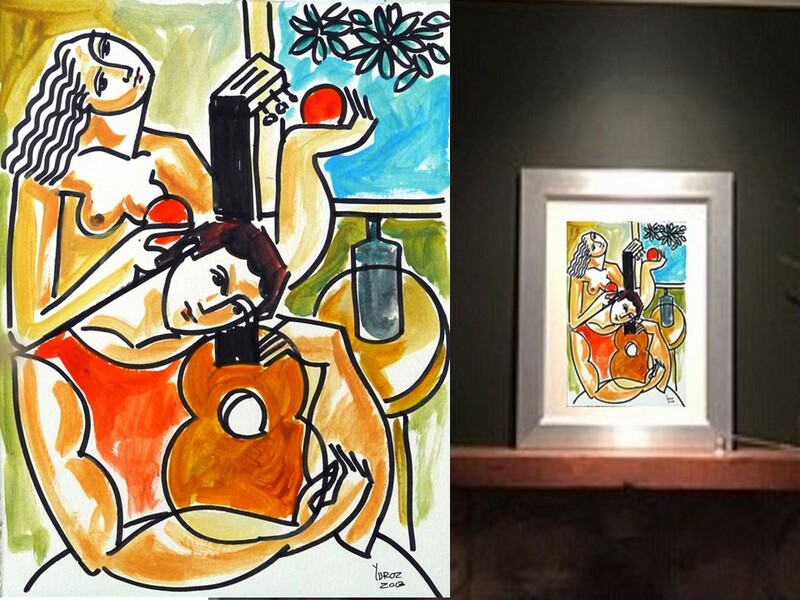 In the above line drawing with acrylic and mixed medium, clearly the man with the guitar is the focal point of the painting. He is in his creative trance as symbolized by the full embrace of his guitar. The wine bottle signifies romance. Borrowing from the old Renaissance symbolism, the open window symbolizes the man’s hope for a prosperous future. Here, the woman is very much in the background, reserved and subdued, as she summons her raw fertile power to stand behind her man and his aspirations. Years prior, the artist painted the oil painting above of the original moment that moved him, initially titled “Lost in Love”, Oil on Canvas, 16″ x 20″. Here, the male resembled more closely the male images that appeared in the artist’s earlier work during the era when he painted “The Hug”, and “The Kiss”, both of which were later published in a sold-out serigraph collection. The vase in this painting represents a woman’s womb. With the man’s nurture, the blue roses which are Yuroz’s staple symbols for love thrive proudly in the vase, highlighting the power of love as a medium for healing and growth. Echoing that is the woman’s raw fertile power as symbolized by the pomegranate held high in her hand. The window is open but with no outside distractions. Rather, the plump pomegranate and the tip of the blue roses are on full display along the same line of sight as the open window’s plain blue sky. This time, the woman behind the man is more prominent as the artist gave her red hair, a way of Yuroz to subtly include his female in the visual circle with the red vest and the red pomegranate that guide viewers’ eyes around the painting. The hue of this painting is very warm and intimate, transcending romantic intimacy conveyed in the lovers’ heart songs. As the man strums his guitar with no strings, the woman is “Lost in Love” with closed eyes, savoring her lover’s serenade. 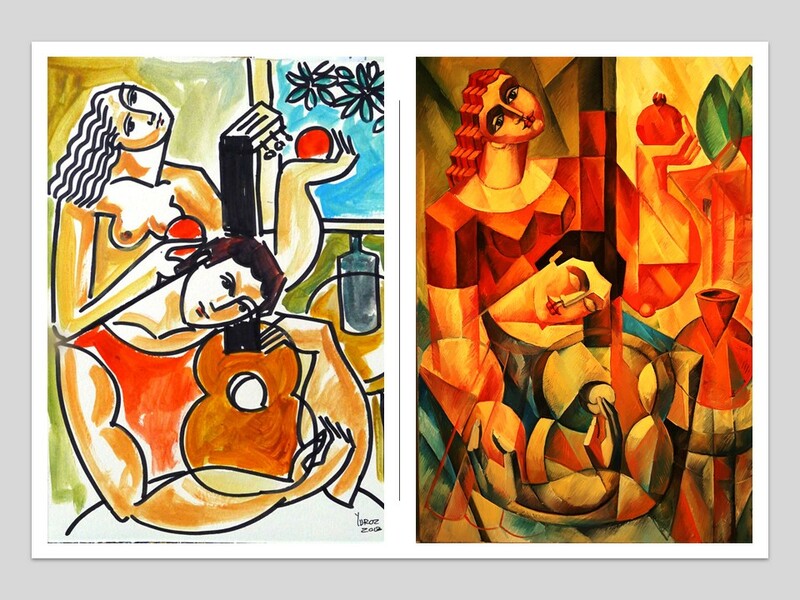 When Yuroz represented this moment again in 2013, this time connecting the neck of the guitar, the tool for the man’s creative expression, with the woman’s pomegranate-holding-arm using his coveted cubist brushstrokes, he titled it “Vision of the Future”, a 40″ x 30″ oil on canvas masterpiece, placing the emphasis back on the woman and the joint vision for a great future together. The vase lays empty awaiting the sow of the seeds, as the female holds her pomegranate high. The open window shows a clear vision of a comfortable and harmonious setting for future togetherness as the artist draws attention away from the man in a light blue shirt, highlighting his embrace of his female’s arm and the strumming of his guitar in the forefront. 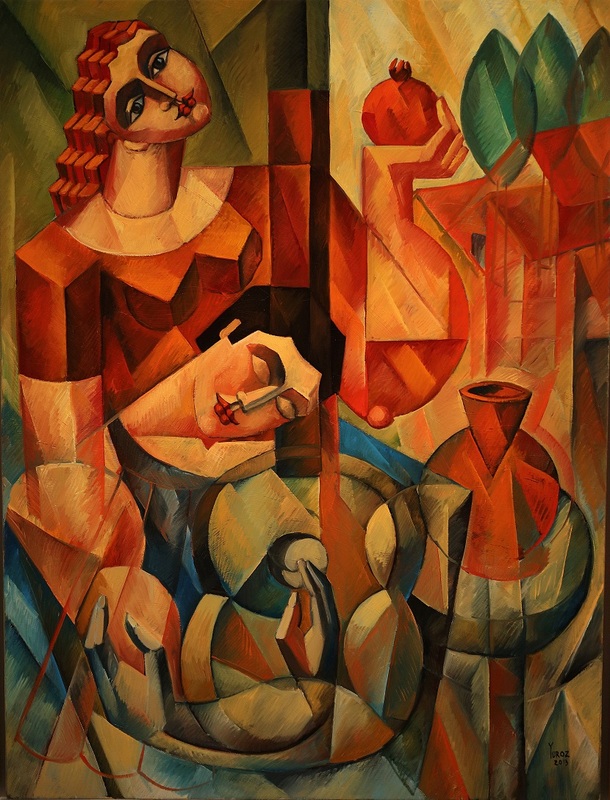 This cubist masterpiece is currently on display in our Los Angeles gallery. Contact us to schedule a special viewing. This entry was posted in Collections, Pandora's Take and tagged Inspired by many things, Vision of the future, Yuroz. Years ago I bought Pink Roses from Yuroz. Love his work.